Since 1868 capital of the State of Georgia in the United States. The city was captured and burned by the United States troops in 1864, and all of the civic and congregational records were destroyed. 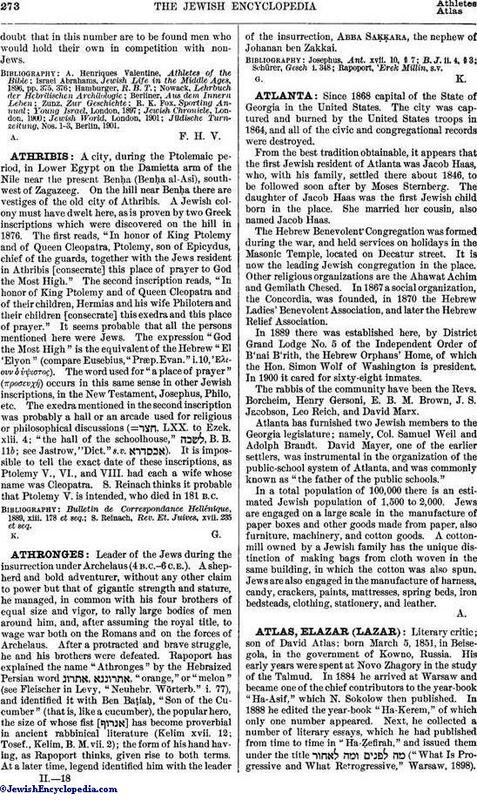 From the best tradition obtainable, it appears that the first Jewish resident of Atlanta was Jacob Haas, who, with his family, settled there about 1846, to be followed soon after by Moses Sternberg. The daughter of Jacob Haas was the first Jewish child born in the place. She married her cousin, also named Jacob Haas. The Hebrew Benevolent Congregation was formed during the war, and held services on holidays in the Masonic Temple, located on Decatur street. It is now the leading Jewish congregation in the place. Other religious organizations are the Ahawat Achim and Gemilath Chesed. In 1867 a social organization, the Concordia, was founded, in 1870 the Hebrew Ladies' Benevolent Association, and later the Hebrew Relief Association. In 1889 there was established here, by District Grand Lodge No. 5 of the Independent Order of B'nai B'rith, the Hebrew Orphans' Home, of which the Hon. Simon Wolf of Washington is president. In 1900 it cared for sixty-eight inmates. The rabbis of the community have been the Revs. Borcheim, Henry Gersoni, E. B. M. Brown, J. S. Jacobson, Leo Reich, and David Marx. Atlanta has furnished two Jewish members to the Georgia legislature; namely, Col. Samuel Weil and Adolph Brandt. David Mayer, one of the earlier settlers, was instrumental in the organization of the public-school system of Atlanta, and was commonly known as "the father of the public schools." In a total population of 100,000 there is an estimated Jewish population of 1,500 to 2,000. Jews are engaged on a large scale in the manufacture of paper boxes and other goods made from paper, also furniture, machinery, and cotton goods. A cottonmill owned by a Jewish family has the unique distinction of making bags from cloth woven in the same building, in which the cotton was also spun. Jews are also engaged in the manufacture of harness, candy, crackers, paints, mattresses, spring beds, iron bedsteads, clothing, stationery, and leather.